Apple has cut HomePod prices by around 15%, meaning U.S. customers can now purchase the world’s best and most private smart speaker system for $299. 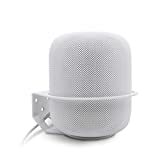 HomePods are now a little more affordable worldwide, in the UK, list price has dropped from £319 to £279, meaning a lot more customers will likely feel comfortable with it. While it seems likely the discount reflects slow sales of Apple’s stunning music system it is still great news for customers. I absolutely recommend these systems for astonishingly clear and accurate music playback. “When you use two paired systems, you get true stereo supplemented by intelligent sound enhancements that make your audio experience even more unique,” I wrote in a review here. These speakers are also much more private than the surveillance capitalist snoops you’ll get from other manufacturers. Smart systems from Amazon and others listen constantly to what is said and send recordings of what is said to the cloud when activated, and remain clearly tied to your account. HomePod anonymizes any recordings it does keep, but it also puts enough intelligence on the device to figure some things out. The fact Apple just made them a little more affordable is to be welcomed. They are the best compact music systems I’ve ever used.